At some point on my watch journey, I made a resolution to resist all the shiny new things that get paraded in front of us daily and just start collecting the icons. The classics. The unquestioned cornerstones of modern watchmaking. Watches whose aesthetic, technological and for-the-good-of-humankind breakthroughs still resonate today. How’s that working out for me? Hmmm, there have been occasional slip-ups, and some redefinitions of what is “iconic” (Nomos makes modern classics, right?) 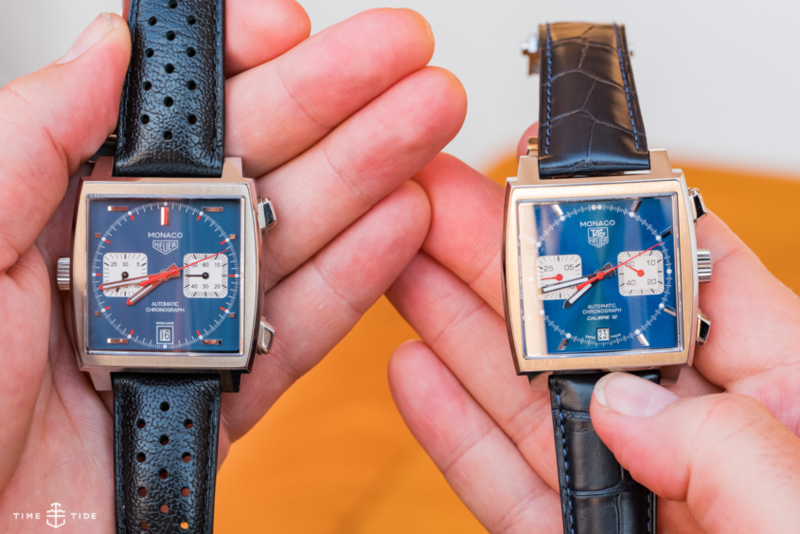 but acquiring a TAG Heuer Monaco was to be a satisfying tick of the square-watch box. The only problem was, when I went to pull the trigger, there was an unexpected dilemma, a crossroads with two signposts – one pointing to a version powered by the Calibre 11 (reference CAW211P) and the other running off the Calibre 12 (reference CAW2111). So you’re getting a Monaco – great! But are you sure you’re making the right choice about which one – the Calibre 11 (left) or the Calibre 12 (right)? Both have their merits, and both have a surprisingly legitimate connection to the original model, so which one would it be? The Calibre 12’s metallic starburst dial is more faithful to the very first blue-and-grey metallic dialled models in 1969. 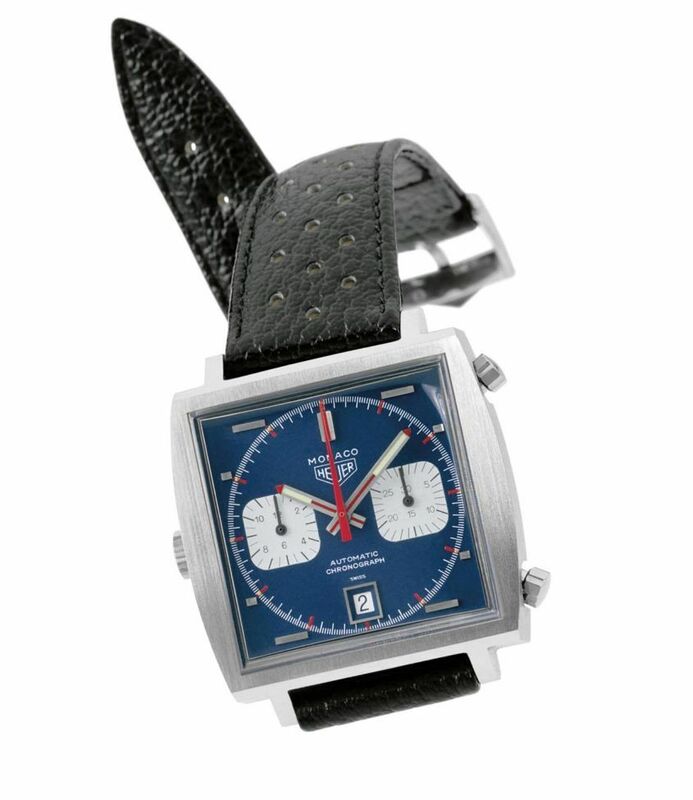 But the Calibre 11 is pretty much a dead ringer for the 1971 McQueen… decisions, decisions, decisions! I used the backdrop of the city of Monaco – thanks to TAG Heuer, who hosted us there for the 2017 Monaco Formula One Grand Prix – to dive deep on this one. Not for the faint-hearted, but for those at the crossroads this video should help. The Calibre 11 looks to be a carbon copy of the very first Monaco, the 1133B, pictured, from 1969. 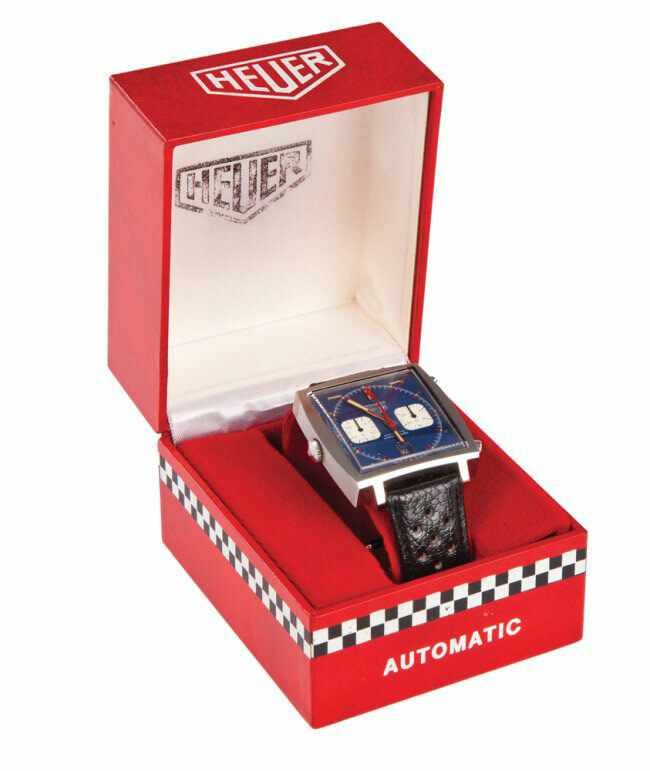 But it’s in fact modelled on the “McQueen” version, which had a subtly different dial, from a couple of years later. The original 1969 Monaco was also released in a grey-dialled version, the 1133G. 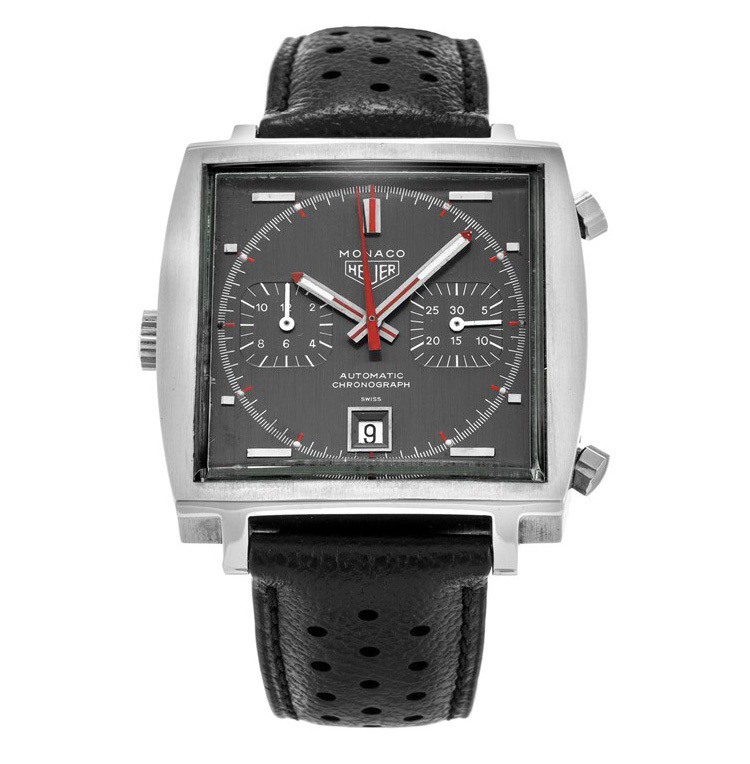 A 1971 Heuer Monaco 1133B worn by Steve McQueen, that sold at auction in 2012 for $799,500 USD.